CISF Constable Tradesman Admit Card 2017 - Get here CISF Constable Tradesman Exam Date and Schedule 2017 Online CISF Tradesmen Exam Admit Card , BSF CT Hall Ticket/ Call Letter Download PST PET test Date Schedule for 2017 CISF Tradesman examination. 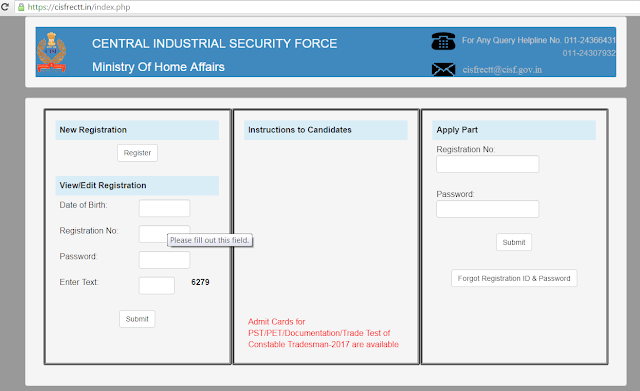 CISF Has Released Online Admit Card for the Trademan Exam 2017. The CISF Call letter/ Admit card the candidates can download form the official website https://cisfrectt.in at each stage of the selection process i.e. for PET(Physical Eligibility Test)/PST & documentation, Trade Test, Written Test and Detailed medical examination for CISF Trademan during the recruitment process. the candidate will be informed through SMS /E-mail to sort out the query immediately as far as possible. These are the CISF Trademan Selection Process.